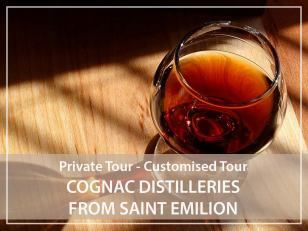 Unlock the secrets of Cognac eaux-de-vie from Libourne/Saint Emilion or Blaye to discover the secrets of Cognac eaux-de-vie. Today, the Cognac vineyard is known worldwide and is divided into 6 CRUS (production areas): La Grande-Champagne, Petite Champagne, les Borderies (the smallest), les Fins Bois, les Bons Bois and les Bois Ordinaires. with a guided tour of the Cognac vineyards. and to meet some of the vine growers and distillers of the region. We can also plan some stops in the charming villages of the Charentes countryside or in pretty romanesque churches. With me, you can enjoy the narrow roads that cross the vineyard and understand the differences between terroirs that make each Cognac unique. I will help you to push the doors of several distilleries, take a look behind the curtains, in order to understand the specificities of the soils but also the secrets of ageing process in oak barrels. whose secret recipe is kept by each winegrower! Do not hesitate to let me know your wishes and interests in terms of discovery or tasting and I will help you to make bookings in the cognac distilleries that will meet your expectations.